This evening, I finished preparing dinner but realized everything was vegetarian. And if you think like me, vegetarian food is good but it's still lacking one thing. What's missing, you might ask? I looked at our dining table and I immediately knew what would make dinner complete: a dish of shrimp. I had one pound of small shrimp begging to be cooked. So in less than 30 minutes, I whipped up some tôm kho, which is Vietnamese for shrimp in caramel sauce. 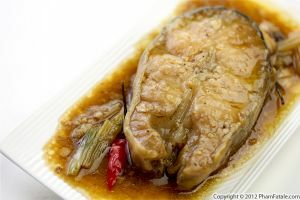 The key is the amber-color sauce cooked with coconut soda (if you're lucky and have fresh coconut water, it would taste even better), onion, garlic and a hint of good quality nước mắm (fish sauce). Even though the most of my family are vegetarians, if cooked properly, the scent of this seafood dish doesn't bother them. 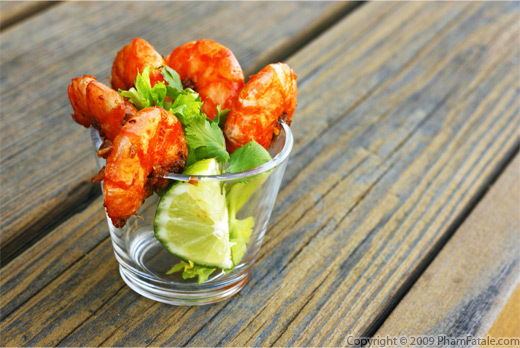 Prepping the shrimp: Rinse the shrimp under cold running water and pat dry using a paper towel. 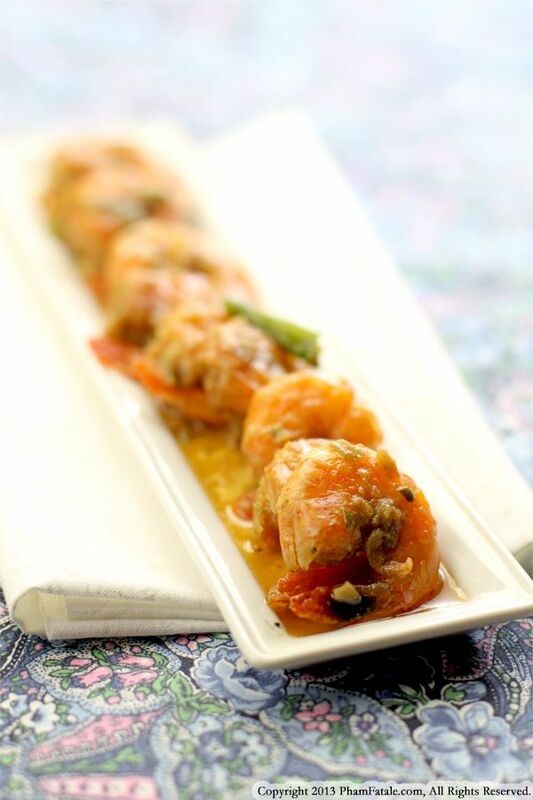 Repeat the same procedure for each shrimp. Sprinkle with red chili powder. Toss well. Use a wok with a matching lid. Add 2 tablespoons of canola oil. Once the oil is hot, add the garlic and freshly grated ginger. Cook for 1-2 minutes until fragrant. 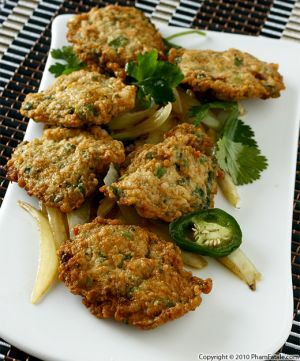 Add the green onions and cook for 2 minutes, then transfer to a plate. 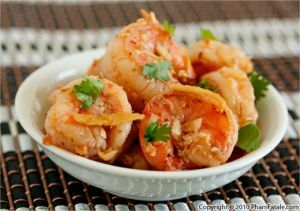 Place the shrimp all at once into the hot wok and spread them into one single layer. Pan-sear for a minute; flip the shrimp and cook for an additional minute. Transfer the shrimp to a platter. Set aside. Making caramel: In the wok, dissolve the sugar with 1 tablespoon coconut soda and cook with the kaffir lime leaves, julienned ginger and the chiles for about 2-3 minutes over high heat, then slowly add the fish sauce, stirring constantly. Return the green onions to the wok. Note: I added the chiles whole so the dish has a nice aroma. 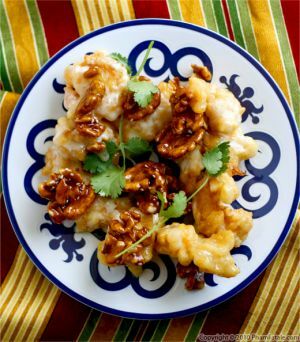 If you like the dish spicy, finely chop one of the chiles and add to the caramel sauce. Make sure not to rub your eyes after touching chile pepper seeds. Return the shrimp to the wok. Add the rest of the coconut soda to barely cover the shrimp. Bring to a boil, then lower to a gentle simmer and cook for about 10-15 minutes. The caramel-colored gravy should be thin. Adjust seasoning with more mushroom seasoning salt (if necessary) and black pepper. Discard the kaffir lime leaves. Serve immediately with jasmine rice and Vietnamese sautéed greens. All the ingredients listed above can be found in Asian stores. Published By: Jacqueline Pham on May 29, 2013.